Rural Revolution: Truth or fiction? This alleged letter from a teacher to a parent has been floating around the internet for awhile. Recently it was posted on the Vox Popoli website. BUT...that doesn't mean it's true. The reason I question whether this letter is true or not is because it's so unbelievable - and such a perfect example of Marxist brainwashing at work - that it's almost too good, if you catch my drift. But if it IS true, God help us all. And that's why we homeschool. Alex consistently defied me. During class he contradicted me numerous times when I insisted that the length of one kilometer was greater than that of one mile. Every other student in class accepted my lesson without argument, but your son refused to believe what I told him, offering such rebuttals as, “You’re lying to the class,” and commanding other students to challenge my curriculum. Although he was correct, Alex’s actions show a blatant disregard for authority, and a complete lack of respect for his school. In the future, Alex would be better off simply accepting my teachings without resistance. Please see to it your son understands this. There are two layers in this issue (disregarding whether it is true or not). First, little Alex SHOULD respect his teacher. Part of the progressive movement is to teach children that they have a RIGHT to "question authority" and speak their minds like an adult would.Parents need to support the authority that teachers have to the fullest. The second is that the teacher is a bone head and the PARENT needs to address this with the teacher. When a teacher makes a blatent mistake, they can teach a valuable lesson to the children by correcting themselves. 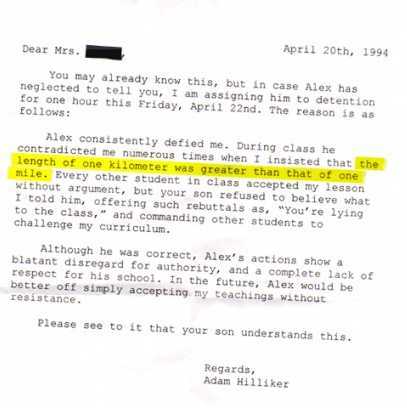 The proper thing to do would be for little Alex to talk to his parent about the mistake and the parent should have called immediately to talk to the teacher about correcting things. Lacking that, Alex should have gone to the teacher in private to ask for a correction of the facts. So, one one hand, an idiot teacher is a problem for all students, but that is an issue for the parents and the administration to handle, not the children, which reenforces a loack of respect for a person in authority. Alex sounds like a future leader. The teacher sounds like my mother in law. No I see the teacher as a future politician. (can you say bailout?) Alex will either get incensed and fight against alleged authority for a long time or become another one of those "what if...lives". I too have stories of being defiant to my teachers when they were wrong. Politely at first but did not stop that from escalating if I needed to. I am now in my late 50's, but I had a similar experience in my youth. A teacher told the class that the ancient Egyptians had never invented the wheel, They had no wagons for carrying goods, etc. The front cover of the book we were studying had a photograph of a tomb carving showing a Pharaoh, in a high-wheeled chariot wielding a speer at his enemies. When I pointed out that they did, indeed have very good wheels, (holding the book up to show) I was sent to the principal's office and my father was called at work. Similar results came from my assertion that ancient peoples believed in dragons because there had once, indeed been dragons. Ancient peoples could dig up their bones, as we do today. We just call them by a different name- Dinosaurs. My father supported me to the bloody end, but he insisted that my rebellions be worded in polite and non-combative manner. If a teacher did not accept this with good grace, it was no longer my fight, but his. To 50 year old Anonymous: What a great Dad you had! It must have been fantastic, having that kind of support at home. I never told my parents anything that happened at school, good or ill, because I didn't know how they would react. Later, when my mom discovered some of the abuses I had suffered at a certain teacher's hands, she asked me why I never told her. My answer? "I didn't think you would listen." She was upset that she couldn't go back and correct the problem, but she never communicated (at the time) to me that she would even hear me out, much less take care of it. Now, as a Mother myself, I try to always make time to listen to my children, regardless of what subject, or how long it takes them to finish, because I want them to KNOW, without any doubt, that I will listen to them. I don't want them to do as I did, keeping quiet about things that REALLY should have come out, because they don't think they can talk to me. And that's another reason that I finally started homeschooling. A position deserves respect. A person may not. I respect the Office of the POTUS. I do not respect the current man who is president. How can I? He is trying to destroy my way of life and my country. Similarly, a teacher deserves respect for the job, but not necessarily for what s/he says. We must all speak out against lies and deceit. I say good for fictional little Alex. Kids' minds are like sponges, and once the lie is planted, it is much harder to extract it. I suspect the "letter" that has been circulating in the internet is actually one of those planted by progressives to see who sends it to whom. They may have a cookie attached to it and then they could track which websites the forwarder visits. I am not paranoid! I know the lies and tricks and that the "means justify the ends" tactics that the left uses. How do I know these things? I live in California. People who show no respect will get none from me. The progressives know how to use our good manners and general sense of decency against us. They have used our Constitution against us for decades. Now they stomp on the Constitution because they can. I will not be a willing participant in their destruction of this country, and that includes my encouragement of anyone, child included, to speak out when being lied to. Not that I think children should be used as political pawns, but the left has been using our children as pawns ever since the teachers' unions took over the educational system. Lies deserve no respect. And the liars who tell them deserve no respect. my sister in law is a retired high school history teacher (incl.soc.studies, economics etc) who i love and respect very much...but there are subjects and times of the year that i avoid being around her. first of all, alot of teachers, old and young, think that they are right and will stand on a tree stump and swear that a tree never grew there..and god forbid that you correct them-privately or otherwise! i have found that teachers that are like this have certain beliefs ingrained into their souls that no amount of attention can relieve them of. they have a tendency to be socialist or very left leaning democrats, somewhat radical in their thinking, think that we should be kind and forgiving to those who cross our borders illegally...and will tell anyone who will listen that fox news network are the biggest liars in the world. and i still love my sister-in-law..i just avoid her company during election time and yes, i bite my tongue till it hurts. we had it out a few months ago but in the end she admitted to me that yes, she was a socialist. respectful or not, student or teacher, kid or adult...wrongs have to be worked out...even if someone has to apoligize...that is called self respect by some. My astronomy professor in college was actually an algebra teacher. He admitted to the class that he didn't know much about astronomy. I've studied astronomy all my life. When the prof made a few mistakes, I raised my hand and corrected him. Later, he spoke to me in private and said even though I was correct, it was impolite and rude to correct him in front of the class the way I did. He asked me to put myself in his place. How would I feel? I understood and felt terribly embarrassed. I apologized to him. I learned to be less disrespectful and he learned to be more humble. Unfortunately, our present-day liberal teachers and professors have little to no humility. I agree with "herbalpagan." A young child in a grammer school class has much less reason to question his teacher than a college student. He should be instructed by his parents to tell them when his/her teacher makes an incorrect statement, and let the parent talk to the teacher or the principal! As someone who has been an adult instructor (college level military training), I have a bit different perspective than some on this one. A teacher should know the material well enough that mistakes like this don't happen, period. If the teacher doesn't know the material that well, s/he shouldn't be teaching it. Yes, of course people make mistakes. However, when one knows the material that well, a correction by a student for a misspeak is easily absorbed. "Yes, thank you, I misspoke. Did everyone get the correction? Moving on...." A correction in a matter of fact is only taken as disrespectful if either the manner of delivery is disrespectful (another issue entirely) or if the teacher is clueless and shouldn't be teaching anyway. If the first, behavioral correction is needed. If the second, a new teacher is needed. Both may be required. However, categorically saying that students should never correct teachers is teaching our children to never question authority, even when they know the authority is wrong. Isn't that part of what is wrong with our country, that the marjority just accepts whatever garbage the politicians give them? I only scanned the comments so take this fwiw. Remember too that there is many a good teacher, that HAS to teach something a certain way whether they believe it or not. They have a certain amount of information that they are required by state law to impart to their students and a timeline to do it. They can't take the time to deal with every disagreement over the text that they are teaching. Right or Wrong. The breakdown is in the system not the individual, though most of the individuals have bought into the system, so what are you going to do? What I am doing is homeschooling. Everyone can do that, every parent should be doing that, whether their kid goes to public school or not. I would tell my kid that brought that note home, "no, your teacher is wrong, that is okay, she probably doesn't know any better, you do though, be respectful, but check anything out with me or Dad that you aren't sure of" that is every parents responsibility. If a teacher is wrong, and the mistake is not corrected in front of the class, there is a very probable possibility that the students will NEVER learn the correct version! This is never acceptable! We're not talking philosophy class, where everything is endlessly debatable. This is not theology class where everything is endlessly interpretable. We're talking mathematics, where it's either right, or it's wrong. Period! It shouldn't be embarrassing to a teacher to be corrected on a fact. If it is, he/she is wrong again! Children should be taught respect, yes. Their corrections of teachers should be done respectfully. The teacher should be respectful of the children, too. Enough so, that they're willing to bend over backward to teach only the truth. NO teacher should not be willing to send their students into the world as misled idiots just to save face. And this teacher probably has tenure. And the NEA doesn't want the teachers to have to take tests to prove they have more than half an IQ point. Oy. Herbalpagan, I suspect you are either brainwashed, or a shill, either way, your agenda sickens me. Your Political Correctness at all costs mentality is the very reason our country is sinking down the tubes. How dare a child in the right question an adult blatantly in the wrong (sarcasm), you promote ignorance in favor of truth?! You can't be serious! Your pathetic mindset advocates that it's better to be a polite and ignorant slave, than a free-thinking intelligent human being? Disgusting! You can take your blind obedience and abject volitional stupidity all the way to the Camps. I'm going to stay up here and educate my children to think, question authority and fight for their Freedom. Good luck, you're going to need it, Herbal "the sheep" Pagan ! Wow, I don't know if the article or the 12/10 post should be responded to.. lol. As far as herbalpagan goes, I side with being respectful to people. Gandhi changed an entire country and saved it, and he maintained his composure. I do not think we need to disrespect one another's views or opinions to hold onto our own. We are supposed to be a civilized breed. Is not possible to be respectful in our communications while still holding to our belief, be it right or wrong? I think it is very doable. I remember a time that a teacher told me "it cannot be done." My response was, 'You may be correct, but I would like an opportunity to find out for myself." My instructor laughed but gave me permission. Within 30 minutes, I had found a way to do what she asserted could not be done. I raised my hand, and she asked "Finally give up?" I responded "Actually, if you will just press this key, it will bring up a menu that allows you the option to print in the background while continuing to type." I remember how proud I was of myself. At the time, dedicated wordprocessors were the wave of the future (dating myself I know.) I was so excited that my logical assumption led to her changing the way she taught her students. It worked out well. All I am saying here is, students are going to bring new ideas and concepts to the table and teachers may need to rethink their rigid ways. As much as education has changed, teachers also need to learn to be flexible. They need to encourage free thinking.. thinking creatively, outside the box. A chaotic environment prevents children from learning and 'control' is designed to maintain the decorum. Never should it be used to humiliate, no matter what the child is doing. Our behavior is teaching our children as much as the books are. To insult another's position is cruel and humiliating. It is not necessary to do this to express your own opinion on a particular subject. In fact, it is painful for the person who is being berrated. Regardless if it is politically correct to be polite or not, it is kind to be polite. I can be polite, hold my position, be loving, and still allow you to feel human when it is all over. Politeness is something which is rightly reserved for those who deserve it. Those who propagate intellectual dishonesty as HerbalPagan did, deserve to be taken down a notch or three. Kudos to the 12/10 poster for speaking the truth without sugar coating it. I just found this site by accident but let me tell you I LOVE YOU ALL! 'Bout time someone called a spade a spade! Hey, can I clone all of you to replace the utter idiots I'm surrounded by? I'd sure love to have you all as neighbors! Old post resurrection, but this happened to me when I was a kid. There was no note, and the teacher later apologized, but I was the kid sitting right in front of the classroom atlas, where I could see the 2000 kilometers - 2000 miles scale, and could easily tell you that the kilometers were shorter than miles. Despite mentioning this, the teacher still refused it in the middle of class. Likely to keep a semblance of authority. I still appreciate that she had apologized to me personally the next day, and not this note crap. I still hold that it was the right decision and currently work in a college. I encourage students to correct teachers when they notice mistakes, because to assume that teachers are not students also is a big problem in our society. Everyone is a student, everyone is a teacher, labels don't change any of that. This kid would make a good Marxist. Defying authority when authority is wrong, rather than blindly obeying and accepting everything he is taught. Good for him.